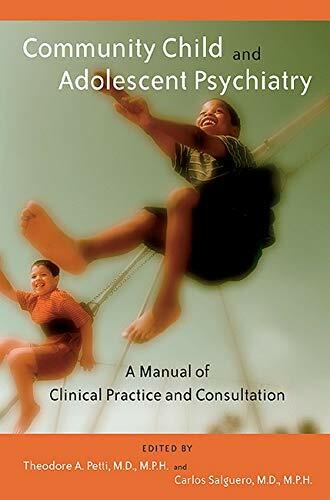 [PDF] Community Child and Adolescent Psychiatry: A Manual of Clinical Practice and Consultation | Free eBooks Download - EBOOKEE! Description: Child psychiatrists and psychologists, clinical nurses, social workers, and other mental health practitioners working in the public sectorAwhere limited funds, poverty, social environments, and bureaucracy add to the daily challengesAcan now turn to Community Child and Adolescent Psychiatry for approaches and insights to make their work easier and more productive. Twenty chapters are divided into four main sections, where 31 seasoned clinicians and administrators detail the most useful tasks, strategies, and tactics for child and family-focused community mental health professionals: -Multiple facets of public sector agency work with or consultation to community agencies from the major mental health disciplines employed in community settings, differentiating roles and responsibilities and detailing consultation phases, including pitfalls -Basic community practice principles and issues commonly faced by public sector professionals, including particular types of agencies and differences between rural and urban practice -Contemporary concerns about the impact of a managed care or cost-cutting environment on service delivery, including reimbursement, differentiating consultation from direct service, and the location of a system of care -Descriptions of the setting or activity of each community agency, including the qualifications that allow the professional or trainee to enter and work in that system -Practicalities of clinical practice or consultation or both in community settings in the current service environment -QuestionsAfrom differing perspectivesAthat mental health care practitioners must consider before consulting to or assuming a staff or administrative position in a community agency, different types of demandsAand discussion of/for each role Managed care has forever altered the service system landscape of mental health care in both the private and public sectors. Community Child and Adolescent Psychiatry provides insight into the public system of care and the requisite tools to manage the rapidly changing clinical, political, and administrative landscape. As a resource guide to the profession, Community Child and Adolescent Psychiatry emphasizes the practical necessities of child psychiatrists and other professionals working with mentally ill youngsters and their families in the practice of community psychiatry and public mental health. Trainees, practitioners, and administrators alike will welcome this indispensable road-map to a higher level of practice in community settings. No comments for "[PDF] Community Child and Adolescent Psychiatry: A Manual of Clinical Practice and Consultation".